The vikings of old existed for one reason: pillaging. Oh, and fighting, they also existed for fighting, so that's two things. Maybe drinking as well. Does looting count separate from pillaging? One could argue it does, which would make it four things. The point is stereotypical story vikings weren't into a lot of froufrou stuff, just combat and loot. 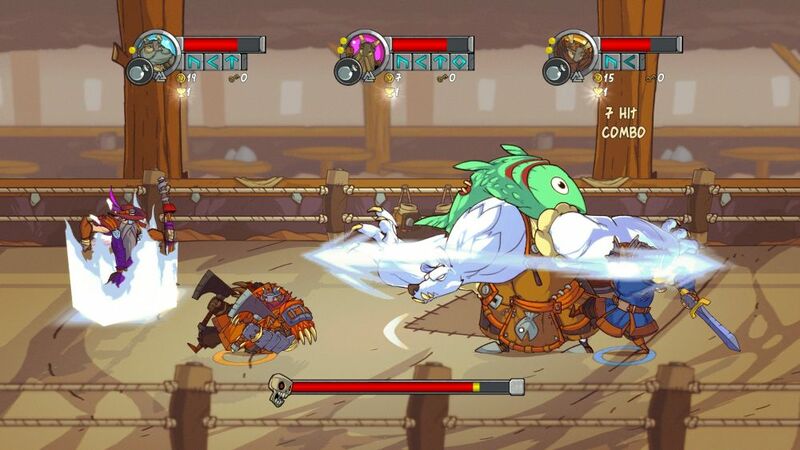 Slick Entertainment's modern beat-em-up Viking Squad capitalizes on that ancient philosophy, cutting out the unnecessary trimmings and focusing on good old fashioned brawl time. Most games these days aim for an epic/cinematic theme. Viking Squad is all like "whatever, hit stuff". The game ditches the vast majority of storytelling opportunities in favor of quick, wordless cutscenes that let you immediately jump in the action. The story is about a big blue viking who enjoys treasure, and your quest to get more of it by any means necessary. You'll sail from port to port, disembarking to disembowel unhuman bad guys, then grab a bag of goodies, toss it aboard your ship and sail away. Simple, and there's a lot of fighting in-between, which is always nice. 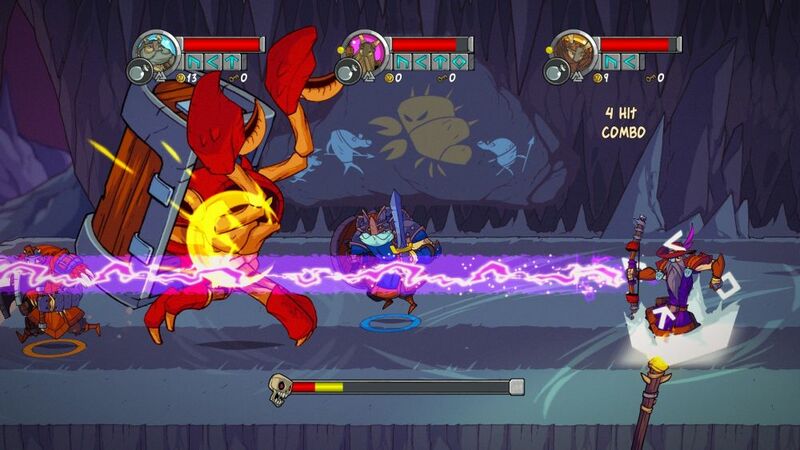 Viking Squad lets you pick from four characters, all of whom are as badass as can be. Their abilities vary depending on the weapon they're carrying, letting you choose a broad playing style by scoping out the steel in their hands. The old guy's got a sword and shield, the other guy dual axes. The woman has a heavy hammer, and the skinny guy a bow and arrows. Your basic moves are limited to a standard attack, dashing, jumping, and using items. Let your rune power charge and you can unleash a special attack that's unique to each character. There's also a screen-clearing mega attack for those times when you just want to watch villages burn. Combos are a big part of the Viking Squad experience. You start with a few basic ones like attack+attack or attack+special. Between levels you can spend gold and trophies to upgrade your stats. You'll unlock new combos every couple of stages, turning those simple moves into fun and flashy attacks. There's also a hefty amount of carrying objects around the screen and breaking barrels, lamps and other environmental extras. And have you ever wanted to tote a gigantic pillar of stone in your palms? Viking Squad lets you do that, so have fun! 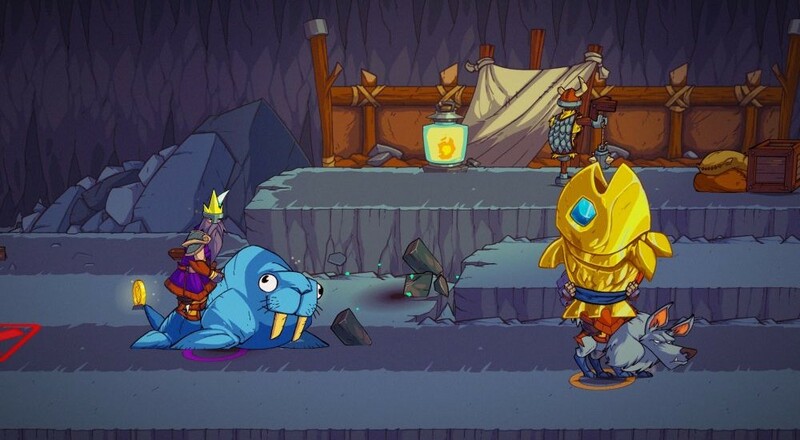 The single feature that really makes Viking Squad stand apart from other brawlers is the use of lanes. Instead of giving you free roaming access across the field, four lanes are marked out from top to bottom. Everything exists in one of these lanes, and you can only interact with things in the same lane as you. This neatly sidesteps the old beat-em-up problem of being a few pixels too high or low from an enemy and whiffing with your entire attack. Lanes are clearly separated, you always know where items and enemies are in relation to your position. Moving between lanes is so smooth and fluid you'll barely even realize they're there. All of the benefits with none of the drawback. Beautiful implementation by developer Slick Entertainment. Page created in 1.8681 seconds.